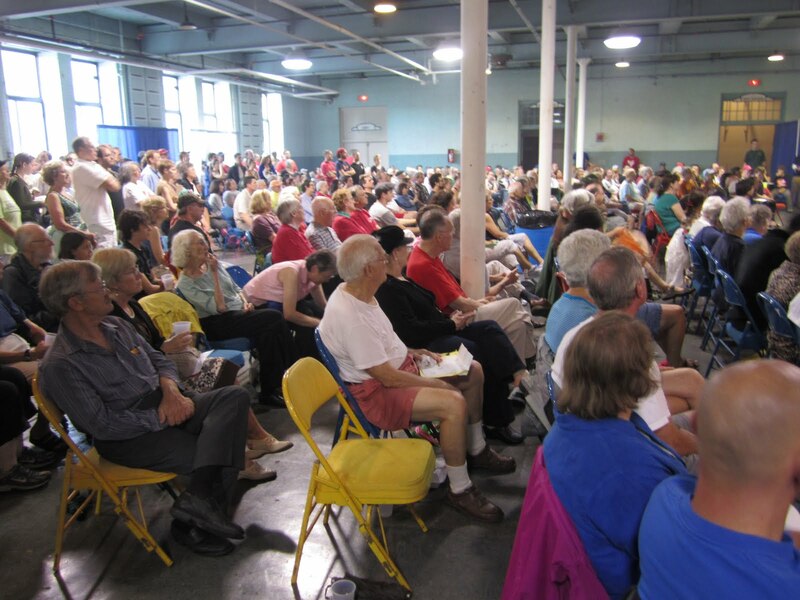 The Vermont Department of Public Service released the draft Comprehensive Energy Plan (CEP) for the state and is now looking for input on it from Vermonters like you. This plan, if done right, can provide critical guidance on how the state should pursue an efficient, clean and sustainable energy future. It’s a very broad plan: it touches not only on electricity but also on the energy we use to get around in our cars and trucks and how we heat our homes and businesses. It examines subjects as diverse as the economy and jobs, public transit, land use patterns, natural gas, geothermal energy, wind power, hydropower, and the use of our forests for biomass energy. The final plan is expected to be released in November. You can read the plan by downloading it from http://www.vtenergyplan.vermont.gov/. To comment on the plan you can file written comments by 5 p.m., Monday, October 10, 2011, or attend and speak at one of five public hearings scheduled around Vermont in the coming weeks. Other hearings around the state are posted on the website. Although Charlotte and Hinesburg have not been seriously impacted by flooding as a result of hurricane Irene, you may know someone who has been. The information also applies to any failure of onsite septic systems. The Vermont Agency of Natural Resources has issued advice and guidance to homeowners who have experienced failures of their septic systems that you can pass along. It is imperative in such cases to protect drinking water supplies. The ANR press release can be found at http://www.mikeyantachka.com/p/anr-offers-advice-for-homeowners-with.html. The press release also provides links for more information about drinking water safety and health concerns after a flood, http://healthvermont.gov/enviro/water/flood.aspx, and flood clean up and mitigation, http://www.anr.state.vt.us/site/html/flood.htm . 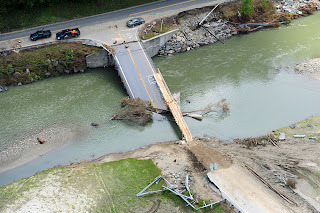 A makeshift walking bridge allows access to Route 100.
heart of the Green Mountains, saw enormous amounts of destruction that will take months, and perhaps years to recover from. ﻿Heavy rains that fell in just a few hours were funneled down mountains swelling streams and rivers until they became raging torrents overflowing banks and cutting new channels through roads, bridges, towns, farms, businesses, homes and peoples' lives. Arial photos of the damage caused by hurricane Irene that were taken by Lars Gange & Mansfield Heliflight can be found at http://www.mansfieldheliflight.com/flood/. As the flood waters receded from Brattleboro, Wilmington, Brandon, Waterbury, Richmond and so many other towns, neighbors and strangers alike immediately pitched in to start the cleanup and recovery. National Guard troops from Vermont, New Hampshire and Illinois moved in with supplies by truck where possible and by helicopter where towns were cut off from land-access in every direction. As of today more states from as far away as Ohio and South Carolina are sending in heavy equipment to help rebuild the hundreds of miles of destroyed roads before construction season ends in December. President Barack Obama issued a federal disaster declaration for Chittenden, Rutland, Windsor, Washington and Windham counties so far, and assessors continue to work in Addison, Bennington and Orange counties. FEMA, the Federal Emergency Management Agency, after leaving Vermont one week before Irene struck, is back to assess and assist both businesses and homeowners who have been affected. Thousands of volunteers have turned out to help in affected areas and thousands more have contributed to flood relief organizations like the Red Cross and the United Way. Vermont's rock band Phish is returning for a benefit concert to help flood victims. Workers from the Vermont Agency of Transportation as well as municipalities are working overtime to restore roads, bridges and water systems. I-89 provide access from the east, and Route 7 and the Lake Champlain ferries provide access from the west. Lake Champlain is still a recreational resource unsurpassed in grandeur and beauty. From Basin Harbor to Burlington and Grand Isle, folks can still come for boating, fishing, camping, and biking. Excellent restaurants and inns abound with wonderful settings for weddings as well as other celebrations. The Inn at Charlotte is within a mile of Mt. Philo, Vermont's first state park, that offers panoramic views of the lake and the valley. 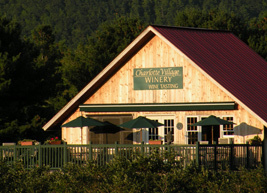 For those who appreciate the "finer things in life" there is no dearth of vineyards and micro-breweries, like the Charlotte Village Winery, Shelburne Vineyard and Magic Hat. Jay Peak in the north as well as the village of Stowe offer more recreational opportunities. Fall foliage season is merely a month away and should be as beautiful as ever. And when winter comes and the snow blows, Vermont will still provide the best skiing in the east. Celebrating Labor Day this year carries mixed emotions as we see the continuing effects of hurricane Irene in central and southern Vermont. Amidst the emotional and physical turmoil, though, we can see the truly important values being played out in the willingness of both neighbors and strangers to help those that have lost homes, possessions, businesses and crops. 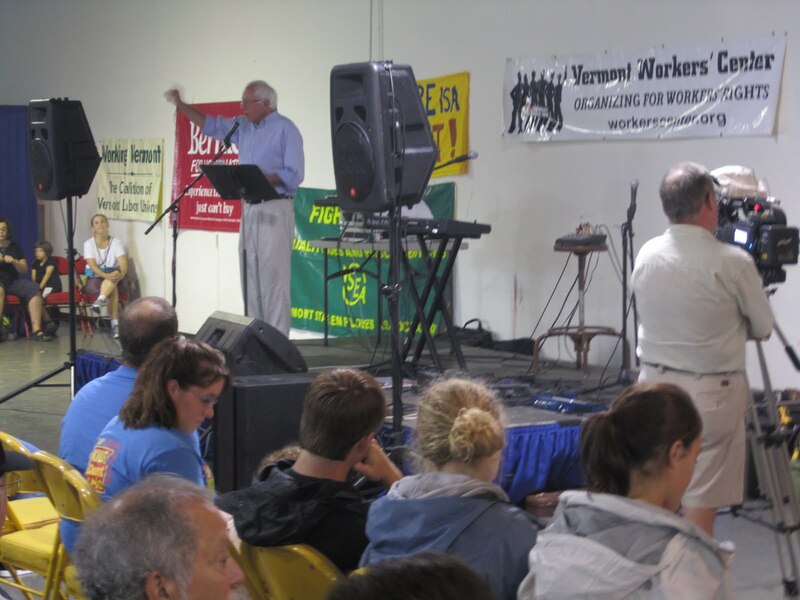 The people of Vermont retain their positive attitude and dignity regardless of the situation. "For more than a century, the labor movement has fought for landmark worker protections and benefits. Many of the values we champion as Democrats were born in the labor movement and we continue to be grateful for their activism and leadership on behalf of working Americans. At a time when the Republican Party seems dedicated to dismantling not only these protections but the labor movement itself, we cannot let this gratitude go unexpressed. Organized labor, like the Democratic Party, has fought on behalf of American workers for the minimum wage, fair hours, just overtime compensation, and paid vacation leave, so that we all have the opportunity to earn a living and have time to spend with our families. The labor movement championed equal pay for women and child labor laws, protecting women and children from exploitation. They fought for healthcare benefits, paid sick leave, workplace health and safety regulations, and workers’ compensation, so that American workers can take care of themselves, do their jobs safely and are protected against loss of earnings if they are injured at work. With our economy still recovering, we cannot forget that it was the labor movement that pushed for unemployment benefits and pensions to protect American families in times of economic uncertainty and allow American workers to retire. We must not take their hard work for granted!" In many ways the economic situation we face today in America is similar to that a hundred years ago. Wealth is being concentrated more and more at the top while those at the bottom of the economic spectrum continue to struggle. What was once a robust middle class has been decimated by lost jobs, forclosures, discrimination based on age, race and even unemployment status! There are those who blame unions and government for the economic downturn, when the real causes have been the export not of products but of production itself from this country; when workers have been squeezed more and more by loss of benefits when they are "lucky" enough to have a job; when the very cuts that are being called for prevent government from exercising its role as a protector of our clean environment, our food and drug safety, and the security of our financial institutions. This Labor Day we should all unite to support the right of Americans to work and demand that government at all levels take the steps to break the economic stagnation we find ourselves in. The opportunities abound to rebuild our infrastructure, encourage research and development and bring jobs back to the United States! Let's make this Labor Day the beginning of a new day for America!